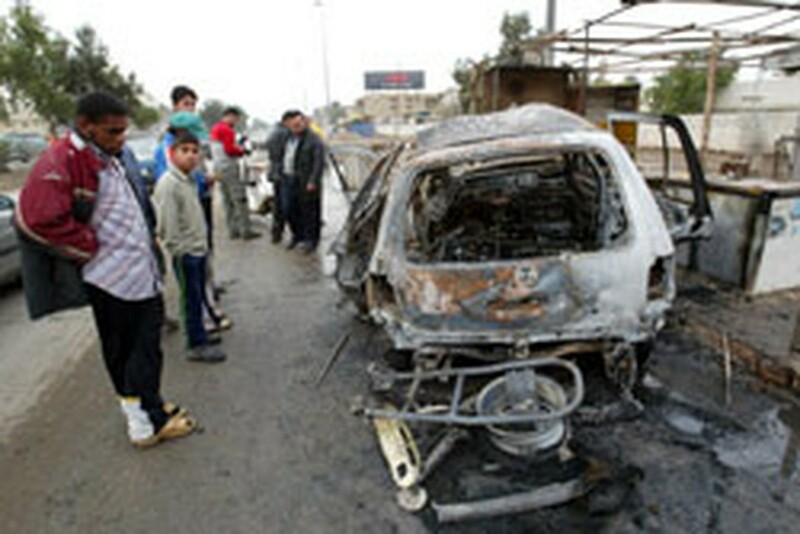 Iraqis inspect the wreckage of a vehicle on Dec. 18, 2006 at the site where a car bomb exploded early today near al-Mustansiriyah University east of Baghdad. Violent attacks in Iraq have soared to the highest level on record, the Pentagon said in a quarterly report, describing Moqtada al-Sadr's Mahdi Army militia as the single largest threat to stability. The report, titled "Measuring Stability and Security in Iraq," said there was an average of 959 attacks per week between August 12 and November 10, the highest recorded level of attacks since Congress ordered the Pentagon to issue the reports in 2005. There was a 22 percent jump in attacks compared to the three preceding months, according to the report released Monday. Sixty-eight percent of the attacks were aimed at soldiers with the US-led coalition, but most casualties were Iraqis, according to the report. "The violence in Iraq poses a grave threat to political progress," the report said, adding that some of the increase "could be attributed to a seasonal spike in violence during (the holy month of) Ramadan." Attacks on infrastructure have dropped, but the cumulative effect of attacks have strained services for Iraqis, according to the report. Fifty-four percent of all attacks took place in the provinces of Baghdad and Al-Anbar. Outside of that area, which encompasses most of what US officials call the Sunni Triangle, "more than 90 percent of Iraqis reported feeling very safe in their neighborhoods," it said. The largest threat to security was Sadr's Mahdi Army militia, "which has replaced Al-Qaeda in Iraq as the most dangerous accelerant of potentially self-sustaining sectarian violence in Iraq," according to the report. It also said that the National Reconciliation and Dialogue Project had "shown little progress," as sectarian violence "has steadily increased despite meetings among religious and tribal leaders." The report also said that total civilian casualties were up by two percent compared to the previously recorded period. The report was released just hours after former CIA chief Robert Gates, 63, was sworn in as US defense secretary, replacing the embattled Donald Rumsfeld. The Pentagon report comes nearly two weeks after a report by a 10-member panel of policy experts headed by former secretary of state James Baker that described the situation in Iraq as "grave" and "deteriorating."